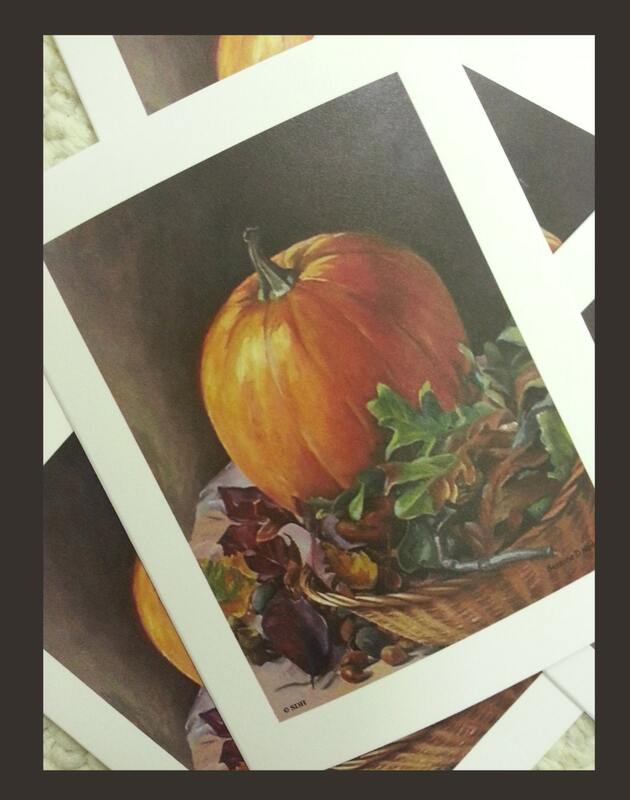 Bright Pumpkin Note Cards & Envelopes; the perfect all occasion card features a beautiful harvest Pumpkin Still Life scene based on my original oil painting. I created this painting several years ago when my children were very young. One gray October day my daughter Faithy, then in first grade, came home from school toting the most gorgeous pumpkin I'd ever seen. It must have been half her size! 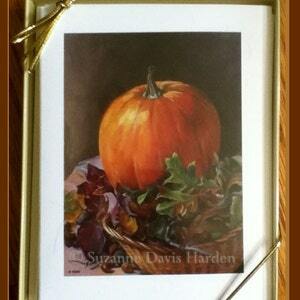 She said that her friend had given it to her from her Mama's garden--it was meant to be our jack-o-lantern. 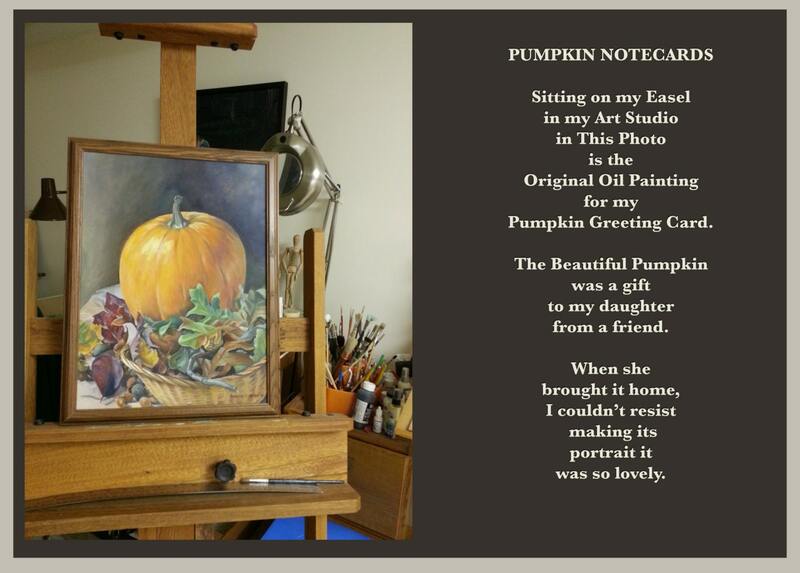 I looked longingly at that pumpkin wishing more than anything I could paint its portrait when Faithy, who must have known my heart, gave me the pumpkin saying it was too pretty to carve up for Halloween. 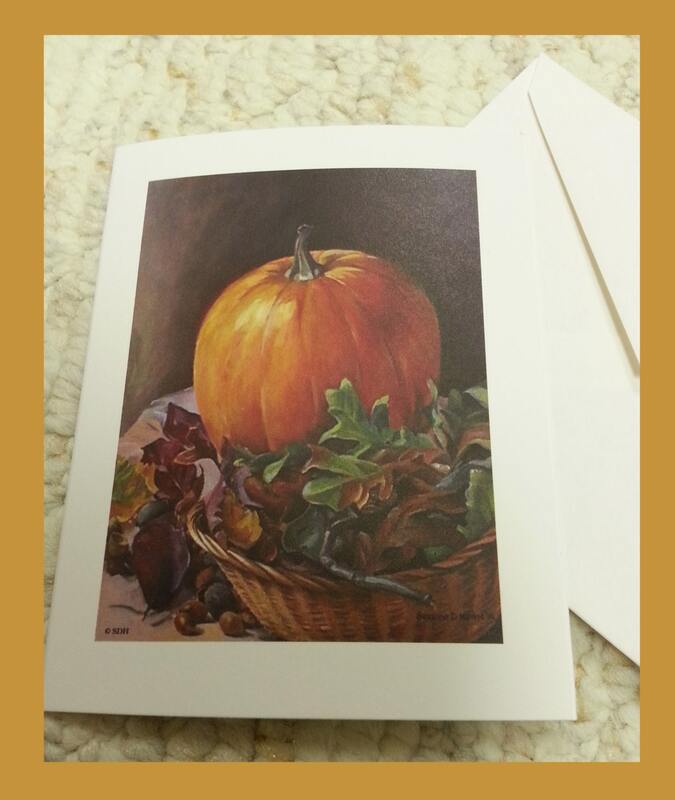 "I'd rather you paint it's picture, Mama-- we can always buy another punkin for our jack-o-lantern..."
I thought my heart would break for joy! 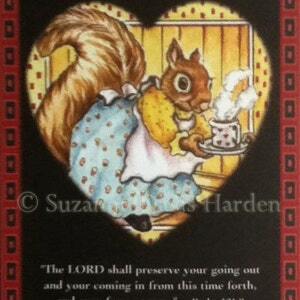 I hugged my little girl and thanked her for her generous spirit. 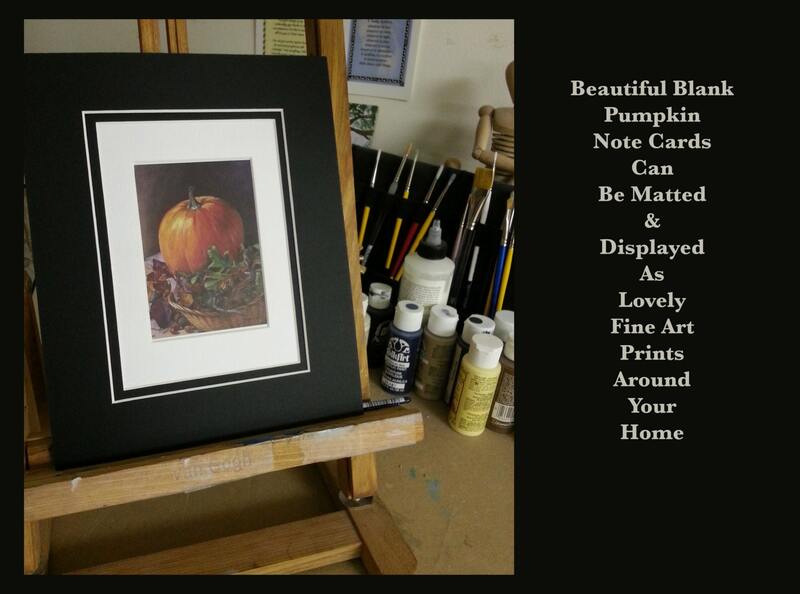 And that is the story of how that beautiful pumpkin came to be immortalized in paint and on a greeting card. 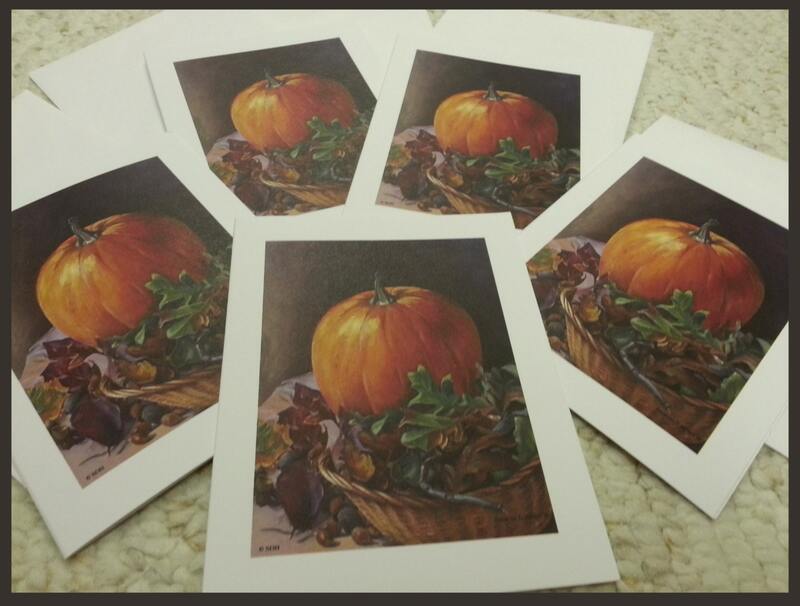 The Pumpkin cards are 5 1/2" inches x 4 1/4" inches. They come with matching white envelopes. 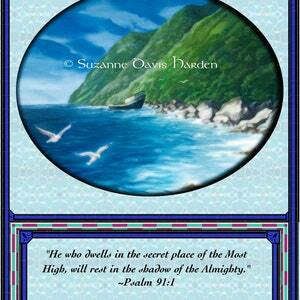 The cards are beautiful and can be matted and framed as mini fine art prints. They are perfect for sending on any occasion. 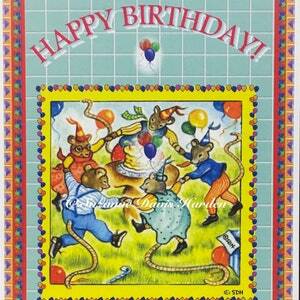 Refer to photos for more information.